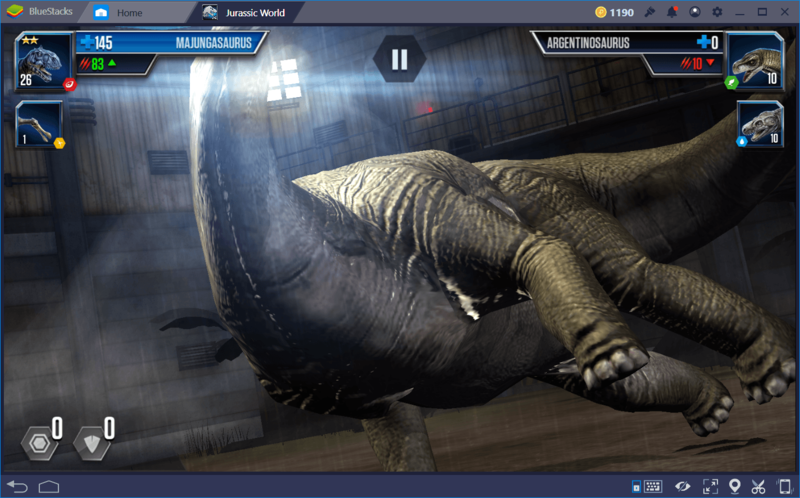 Like with most games, the introductory battle of Jurassic World: The Game, only serves to give a brief outlook of the battle system to the players. The fights in these tutorials are not challenging themselves, as their purpose is to briefly go over the mechanics of how duels work in the game. That being said, while the tutorials are pretty easy, some players might have difficulty with other arena battles, as they can be quite unforgiving for newer players. Furthermore, while the tutorial is good, for the most part, there are still some elements of the battle system left out of the explanation. Whether this last point is intentional or otherwise is up for speculation. 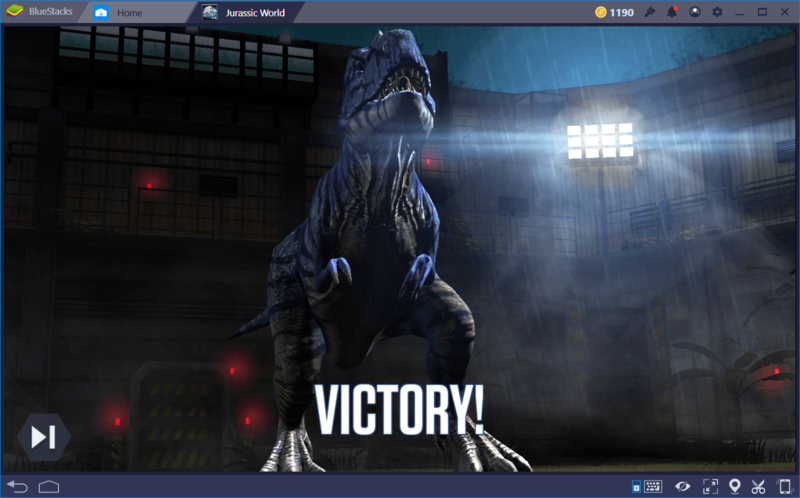 Nevertheless, in this guide, we aim to shed light on the ins and outs of the battle system, including the basic terminology, and even some advanced strategies that you can use on your road to creating the best prehistoric theme park ever. 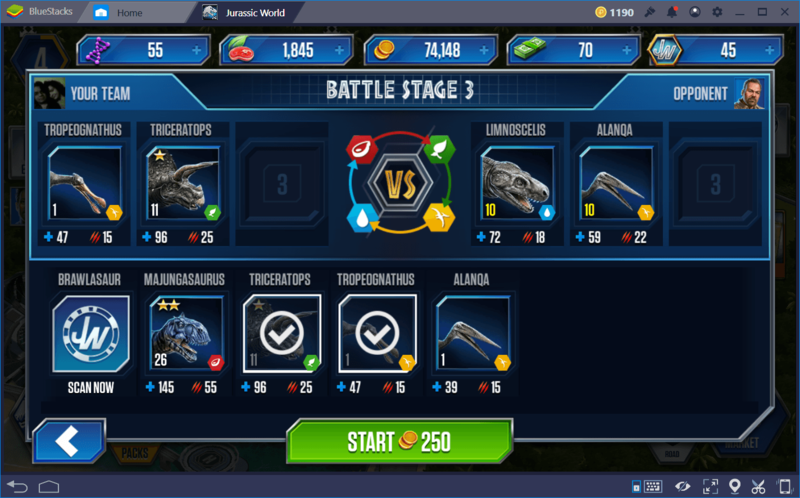 In this sense, once you have a firm grasp of the basics, you can even create your own strategies for use in PvP battles, to show the world what your dinos are truly capable of. By applying all that you will learn here, you will be able to win more battles and push further in the game. However, before getting started with the guide, feel free to check out this simple damage calculator, which will help you to know exactly how hard you need to hit an enemy in order to deal a killing blow, and that will definitely come in handy for when you’re trying to play defensive, waiting to prey on an opening in the enemy’s defenses. In order to use this tool, you must simply input your dino’s attack and health values, and the attack and health of your enemy’s dino. 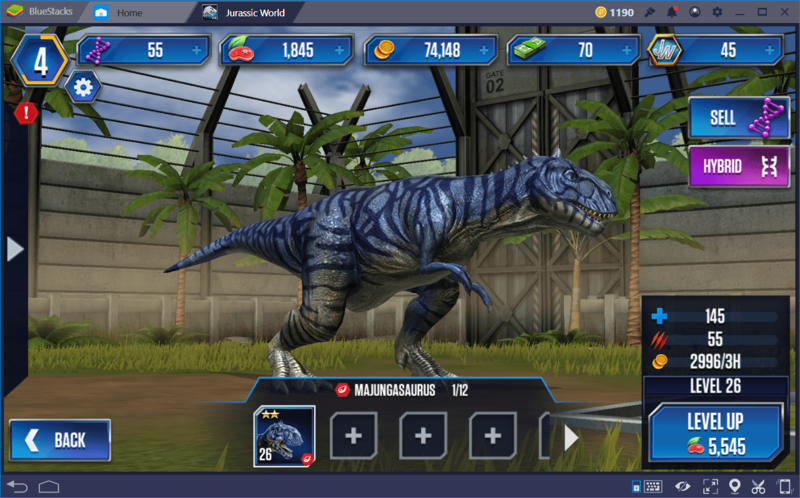 The calculator will then give you results based on the values provided, and also based on how the dinos match up in terms of type advantages. Remember that, when using BlueStacks, you can always easily send the emulator to the background whenever you need to pull up a resource on your browser such as the damage calculator mentioned above, or even this very guide, without the need to close the game first like you would have to if playing on your phone. 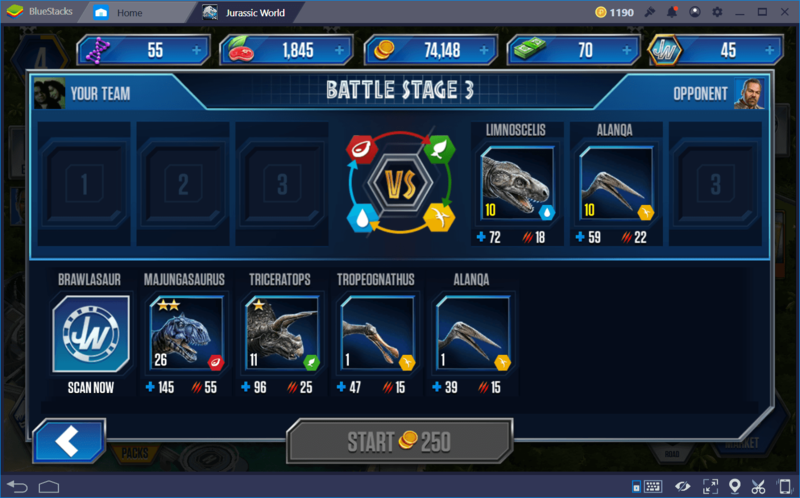 Just like another popular turn-based strategy game where you gather your own beasts and battle them with each other (hint: its name starts with “Poké” and ends with “Mon”), Jurassic World also employs a battle system with type matchups, in which some types of dinos have advantages over the others. The different types of dinosaurs available in this game are Carnivores, Herbivores, Pterosaurs, and Amphibians. You can find info about each type, and how they match up in the arena setup phase preceding each battle. The type matchups work in the following manner: Carnivore beats Herbivores; Herbivores beat Pterosaurs; Pterosaur beats Amphibians; Amphibians beat Carnivores. Those who have an advantage over another type deal 50 percent more damage to these dinos, while receiving 50 percent less damage from them. So you see how type matchups play a pivotal role in battles. Luckily, you can easily switch dinos mid-fight, so it always pays off to have a balanced team, ready to take on any type of enemy. Specifically, the most important thing you can do for your team is to pay attention to the single-player battle arena matches, and build your team accounting for the upcoming battles, as this can easily be done by simply entering the arena matches and checking the team’s lineup. The red meat icon means they’re carnivores, the green leaf icon means they are herbivores, the yellow flying animal icon means they are pterosaurs, and the blue droplet icon means they’re amphibians. In this sense, it’s important to prepare properly for the type of enemies you’re about to face. In the screenshot above, our team of a pterosaur and herbivore is prepared to face the opposing amphibian and pterosaur combo. While the tutorial explains a bit about what the commands do, they fail to elaborate on when they should be used appropriately. This is where this guide comes in! The three main commands you can give to your dinos are attack, defend, and reserve. Furthermore, each of the two first commands can stack to grant bonuses, making them better than the sum of their parts. In this sense, two attack commands hit harder than two single separate attack instances. Conversely, two defense commands block more than two separate defense commands, and so on. The bonus for stacking commands is of about 20 percent effectiveness per stack. Keep this in mind when you’re calculating the finishing blow, as it will potentially allow you to get off an unexpected offensive using your reserve points. In the screenshot below, we killed an Argentinosaurus with exactly 1 point, by matching our attacking capabilities with the enemy’s defensive skills. That being said, always remember that, in single-player arena matches, you will attack first. However, in PvP matches, the first attacker is always chosen at random. Nevertheless, the second attacker will always receive two turns after the first to account for the non-attacking disadvantage. If a dino falls in battle, he is immediately replaced by the next one in the lineup, if there is any. The replacement dino can then launch a counterattack without the opposing team being able to select a command, which basically gives them a chance to make a comeback by leaving their opponents wide open to attack. Nevertheless, even if you’re tempted to go all out with a counterattack, please refrain from using all your points as overkill. Always use the exact amount of attacks necessary to kill the opposing team, as overusing points can lead to a loss further down the line due to not having enough points to mount a good attack of defense. It’s important to always observe what the enemy does in order to find weaknesses to exploit. For instance, it’s easy to know when to attack if you keep an eye on the enemy’s point consumption throughout the battle. If you see that he has 5 points and that he used them all to attack, and still didn’t manage to kill your dino, you can easily destroy him with a counterattack since he won’t have any points left to defend himself properly. However, remember to always use the exact amount of moves needed to dispatch the enemy, and save the remaining points for future turns. 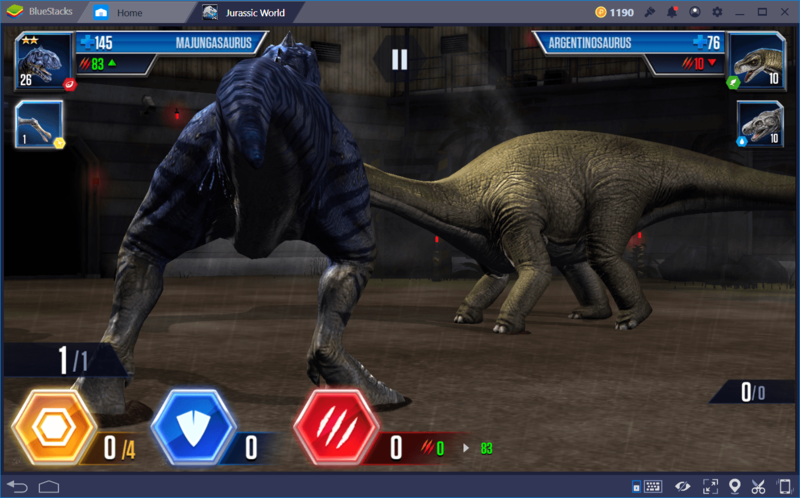 Combat in Jurassic World: The Game is fairly straightforward. There are only three commands that are simple to understand, and even easier to use. However, knowing when to use these moves can make the difference between a good combatant and a mediocre one. With this guide, you will be able to become the former and forge your way through the ranks of the game.